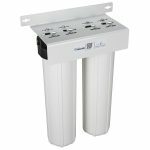 The iSpring WGB32B Three Stage 20- Inch Big Blue Whole House Water Filtration System is designed specifically to reduce the amount of chlorine and heavy sediments in city water. This whole house water filter is perfect for average size homes, apartments, and small businesses. The iSpring comes with an extra filter to ensure that all contaminant are reduced. Pre- assembled 3- Stage Big Blue Housing. The dimensions are 20” x 4.5”. Pre- assembled mounting bracket and screws for convenient installation. Standard set of cartridges are included with purchase. This includes one sediment filter and two carbon block filters. Housing wrench also included with purchase to aid with installation and setting. NSF certified multi- grain sediment filter used for removal of sand, dirt, and rust. NSF Certified CTO Carbon Block filter reduces the amount of chlorine and organic chemicals in water. 2nd Stage CTO Carbon Block filter eliminates odor and taste. 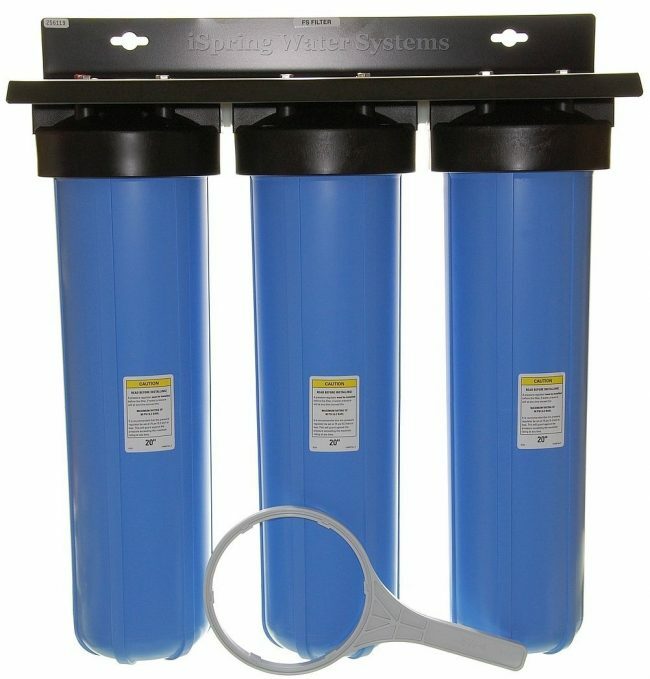 The iSpring WGB32B Three Stage 20- Inch Big Blue Whole House Water Filtration System has received a very high customer satisfaction rating. This is because that this Filter System is known to meet and exceed expectations once it is installed. It is made of high quality materials and comes with several unique features that make is useful for everyday life. One reason so many individuals enjoy this product is because of how well of a job it does at reducing contaminants that are in both city water and well water. Many customers who purchased this product could barely taste or smell the sediments and chemicals that contaminated their water. They also noticed how clean their pipes were since they installed the whole house water filter. Most pipes were free of corrosion, which meant they saved time on cleaning and money on replacing the pipes. Though this 3- Stage whole house water filter is a bit more expensive than similar water filters, it is well worth the price. 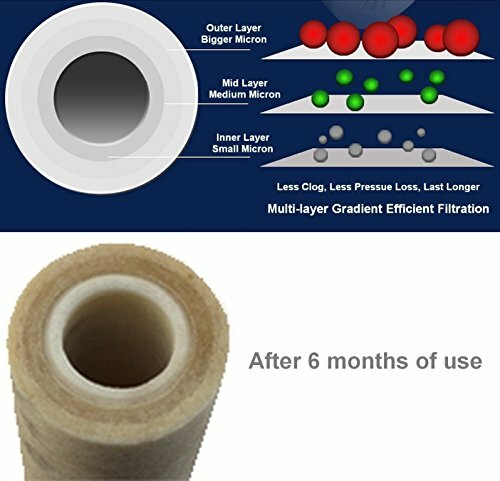 Many individuals who purchased this filter stated that the would definitely recommend this product to a friend or family member. Between the high- quality materials that it’s made out of, the unique features, and the numerous advantages that come with this product, it’s no wonder why! There are numerous advantages that come with purchasing this whole house water filter. These advantages are what make this product so beneficial to the consumer, and are main reasons as to why you should purchase it. The most popular and most useful advantages are listed below. Jumbo filters for the iSpring Whole House Water Filter reduce maintenance frequency. This not only saves time, but also money since filters don’t need to be changed but once a year. Removes up to 95% of sediments (sand, dirt, ect), chlorine, heavy metals (iron, lead, ect), and other contaminants that product a foul odor and taste in drinking water. System filters are made of a durable coconut- shell and only need to be replaced once every 100,000 gallons. 1 inch ports allow for a 15 gallon per minute (GPM) flow rate for the majority of users. Whole system filter weighs about 45- 50 pounds. This is good because it will make it easier to carry and install than heavier water filters. Compatible to be used on both city water and well water. Warranty is still active if chosen to work with either. No need for plumber installation. Whole House water filter comes with clear step by step instructions that are very easy to follow. Though there are numerous advantages that comes with purchasing the iSpring 3- Stage Big Blue Whole House Water Filter, there are a few disadvantages that come with this product as well. These, as always, should be taken into consideration when deciding whether or not to purchase this whole house water filter. The worst disadvantages are listed below, and should be thought about carefully. The iSpring 3- Stage 20-inch big blue whole house water filter does not come with all the parts needed to properly install. Be prepared to purchase proper adapters and connections that are not included. These items normally ranges $10- $15 in your local hardware store. The black metal part is made of material that is not as durable as other filters, and will sometimes be bent or broken upon delivery. Instructions for filter replacement (not installation) can be somewhat confusing. Especially when trying to decide when to properly change the filter. Sometimes leaks from the 1” NPTs that come with product.